This course provides an introduction to activated sludge wastewater treatment plants. In a conventional (plug-flow) activated sludge plant, the primary-treated wastewater and acclimated micro-organisms (activated sludge or biomass) are aerated in a basin or tank. After a sufficient aeration period, the flocculent activated sludge solids are separated from the wastewater in a secondary clarifier. The clarified wastewater flows forward for further treatment or discharge. A portion of the clarifier underflow sludge is returned to the aeration basin for mixing with the primary- treated influent to the basin and the remaining sludge is wasted to the sludge handling portion of the treatment plant. Learn the closed-loop reactor design criteria. This course is intended for civil and environmental engineers and other design and construction professionals wanting an introduction to the design and operation of activated sludge wastewater treatment plants. This course will give environmental and civil engineers and other design and construction professionals an introduction to activated sludge wastewater treatment methods.. 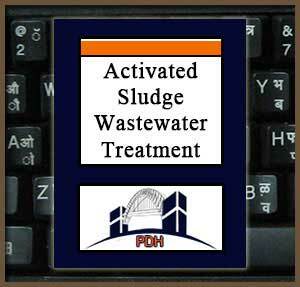 This is an introduction to methods for design and operation of activated sludge wastewater treatment plants. This course will give you technical guidance you can apply when designing wastewater treatment plants using the activated sludge processes.